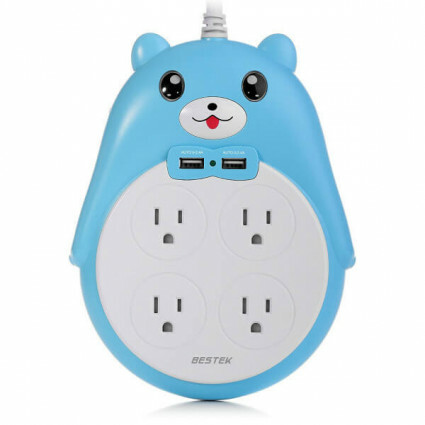 The unique little bear power strip can add loveliness to your home at the time when allowing you to charge multiple devices with 4 AC outlets and dual smart USB ports. Fully protected surge protector makes it safer to use the USB power strip at home or office. Designed as a super cute little bear to add more home loveliness; right angle plug and back slot for easier wall plugging; SR designed cable for strong tensile strength. Included dual USB ports and 4 wide-spaced outlets for multiple charging; smart identification 0~2.4A USB to charge devices at the optimal speed. Built-in full safety guards to protect devices against overloading, overheating, over/low voltage, short-circuit; 900 energy joules protect devices against spikes. • Built-in spring-loaded shutters in outlets reduce the risk of plug metal in by mistake. Made of high quality material, it just feels smooth and effortless to plug in. • A red overload protect button on the left side will cut-off circuit automatically when overload happens. • Muti-protection of over voltage protection, short circuit protection, overload protection, overcurrent protection, surge protection. • Made of Heat Resistant ABS, 750℃ fire-resistance PC shell, 100% copper wire. • UL listed 14 AWG heavy duty power cord can easily competent the daily use.